What happens to you when your name is too long? 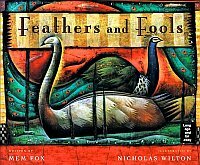 Find out in this wonderful retelling of a Chinese folk-tale. In olden days in China, families would name their first sons with great long names. They felt that their favored, most special first sons deserved such long names. So Tikki Tikki Tembo was given his great long name (that goes on in the book for almost two whole lines) and all was well and good until he got into some danger! This book is super fun to read out loud or listen to. It is a good story with a really fun character name that you get to say over and over. Every time I read this to my students, they love it and want to read it themselves over and over. I can't recommend this book enough! Read it (out loud)! Then share it with someone!